Green Bay Packers head coach Mike McCarthy walks off the field after his team lost 38-31 to the Steelers. 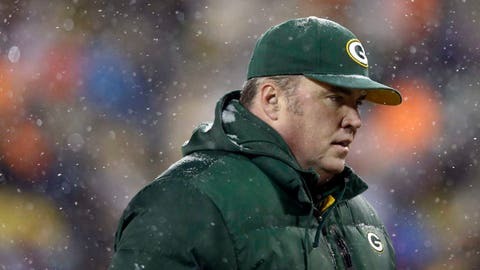 GREEN BAY, Wis. — The chaotic ending to the Green Bay Packers’ loss to Pittsburgh on Sunday didn’t sit well with coach Mike McCarthy or quarterback Matt Flynn. Down 38-31, the Packers got the ball down to the 1-yard line after a four-yard run by James Starks. The clock continued to tick, eventually reaching the 20-second mark when right tackle Don Barclay was called for a false start on the next play. That five-yard penalty included a 10-second runoff, and because the previous play had the clock running, it began ticking again after the umpire spotted the ball and blew his whistle. Green Bay lined up for its next play, now back at the 6-yard line. 10 seconds, 9, 8, 7, 6 . . . Referee Carl Cheffers then took a few steps toward Flynn, perhaps to inform him that the clock was indeed running. Finally, center Evan Dietrich-Smith snapped the ball to Flynn who hurriedly fired a pass to Jarrett Boykin in the end zone. The throw fell incomplete, the clock was at zero and the Steelers had defeated the Packers. That’s not quite how McCarthy or Flynn saw it, though. "Not when the umpire is standing there and the clock is running," McCarthy said when asked if Flynn could have snapped the ball any earlier. "I don’t know what you can ask Matt Flynn to do, or Dietrich-Smith." Replays seemed to show umpire Undrey Wash back away from the line of scrimmage before the clock started. "We knew we were going to get a run-off, we knew the clock was going to run and so we got everybody lined up," Flynn said. "We should have been able to get two plays off. We thought that the operation, getting the ball down and the clock started was a little bit weird. But we should’ve been able to get two plays off. We went as fast as we could." Asked specifically if he felt the umpire was in his way, thus preventing him from snapping the ball, Flynn said, "I don’t know what happened, really. Everything just, the operation seemed kind of weird right there." "I think he was holding the center up and then wound the clock when he was backing up," Flynn added. Flynn did not consider spiking the ball to stop the clock because, in his view, "we should’ve been able to get two plays off." Wide receiver Jordy Nelson appeared to be open in the end zone, but Flynn looked Boykin’s way and couldn’t connect on the pass. That’s where the game ended, with the Packers stuck at the 6-yard line. Even though Green Bay had advanced to within a few feet of the goal line with plenty of time remaining, it resulted in no points and a loss. "It’s tough, because the runoff and then the clock’s going to continue to move once he blows the whistle," Nelson said. "Just the communication of the officials holding us and then all of a sudden blowing the whistle and being able to snap it. All sorts of things were going on." Tight end Andrew Quarless, who contributed a 19-yard reception on the Packers’ final drive, wasn’t happy with the officiating. "I don’t want to blame the refs, but they were a little all over the place," Quarless said. "So it is what it is." "I wouldn’t say it was a lack of urgency," Quarless added. "It was just, we ran out of time. I don’t think it was a lack of urgency." However, lack of urgency seemed to be among Green Bay’s biggest issues in that final sequence. "We were up, set and ready to go," left guard Josh Sitton said. "Told Evan to take his hand off of the ball. When they did that, we all kind of got up and looked like, ‘What’s going on?’ Then he went back and wound the clock as he was going back. I don’t know. I don’t know what their process in that situation is supposed to be. "I’m not a ref, so I don’t know, but it’s frustrating to end on something like that." Cheffers was not asked about the closing moments of the game in the pool report that was distributed to reporters. Regardless of the specific circumstances, the Packers lost a game in which they had a chance to score from the 1-yard line and were unable to. But McCarthy wasn’t disappointed by the effort of his players. "This team, Team 93 as I refer to them, they refuse to lose," McCarthy said. "A ton of fight in them. We needed one more play tonight. Crazy game. Unfortunately, we came out on the short end."